The latest version of the Deeper application for iOS offers Apple users improved performance, handy new features and improved memory usage. Version 6.3.8 launched on App Store on August 31st and is available now for any iPhone and iPad Deeper users. One of the biggest improvements the new upgrade offers is better memory usage. Now the Deeper app will use less memory when you are scanning with your Deeper Sonar. Another handy new feature is the play button in History Mode. Now you can automatically scroll the scans saved in the Deeper App instead of having to scroll them manually. Thanks to a number of small bugs being fixed, Apple device users will also notice improved performance in Night Fishing mode, History Mode, when merging uploaded sessions, and with reporting their registration position. Another addition is the use of a second processor for rendering raw data, which will mean improved performance in History and Sonar Mode. Users can also track which email account each of their sessions has been uploaded to thanks to the latest upgrade. The Deeper R&D team are working constantly to update and improve the software your Deeper device uses. This means that your product will keep getting better with every update. 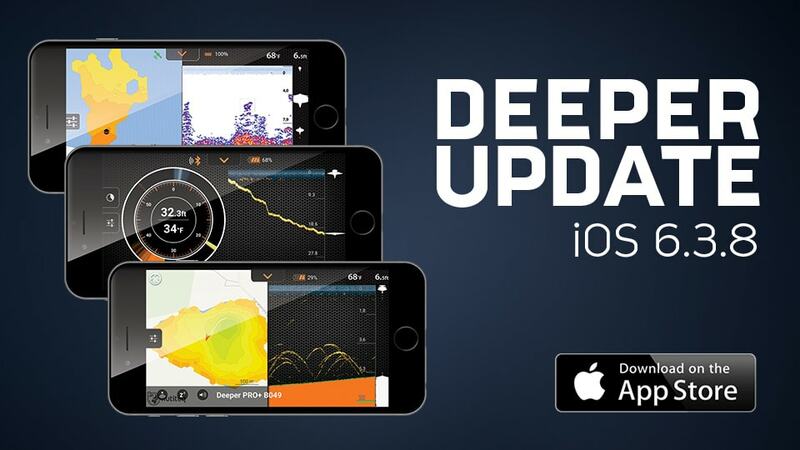 So make sure you regularly update the app to get the best possible performance from your Deeper Sonar. NEW FEATURE: Play button in History mode lets you scroll automatically. Reduced app memory usage when scanning with deeper (performance improvement). Optimized raw data rendering, with some data rendered on second processor, for better performance in History and Sonar mode. Scrolling in History mode improved. Owner email added to History mode: now users can know which account each session was uploaded to.